Last year’s Victorian Alliance House Tour was held around Alamo Square. Spend a pleasant Sunday afternoon on our self-guided walking tour of the Duboce Park Neighborhood. Visit beautifully restored interiors of 19th Century homes. Added to these charming residences is a remarkably preserved post-quake church sanctuary, where you may enjoy complimentary refreshments and a gift shop. All net proceeds benefit the Victorian Alliance historic preservation grants program. $50 purchased by October 8. After October 8 all tickets will be $55. Day-of- tour tickets, if available, will also be $55. Groups of 10 or more qualify for discount price of $40. For tour and ticketing information, please visit victorianalliance.org or call (415) 824-2666. In advance of the upcoming sewer work on Hayes Street, an arborist will perform tree pruning work on some trees along Hayes Street. The work was scheduled to begin last week but was postponed until this Friday 8/12. The pruning work will take about a week to complete. The contractor will continue sewer lateral replacement work on Haight Street between Scott and Pierce streets. The arborist will continue as-needed tree pruning along Hayes Street in advance of sewer main replacement work. Crews are expected to commence sewer lateral replacement work on Haight Street between Fillmore and Steiner streets. The lateral replacement work on this block is expected to take 5-6 weeks to complete. The contractor is also scheduled to begin sewer main replacement work this week on Hayes Street between Scott and Divisadero streets. Please visit www.sfpublicworks.org/haight-hayes for project updates. 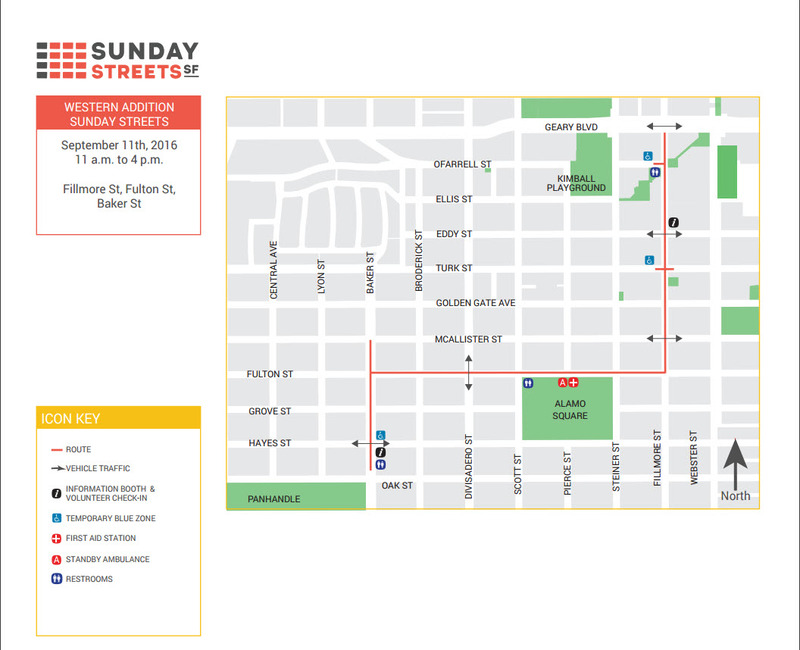 Sunday Streets Western Addition gives you the opportunity to explore Fillmore and Fulton Streets by foot, or bike. Sunday Streets will take place on Baker St between Fell and McAllister Streets, Fulton St between Baker and Fillmore Streets, and Fillmore St between Fulton St and Geary Blvd. Moving at a bit of a slower place, you will find all kinds of hidden gems along this route. From local art, great views of the gorgeous City Hall, the famous painted ladies, to a variety of delicious restaurants, you are sure to have a great experience along this route. Download the route map or view it on googlemaps. Alternate Parking: As an alternative to on-street parking on these days, two nearby parking garages will offer $7 flat rate parking for any vehicles that enter before 12 p.m. The flat rate will be good through 6pm, after which hourly rates will apply. Streets begin closing to vehicle traffic starting at 10:00am, and will remain closed to vehicle traffic until 4pm. Vehicle traffic will be allowed to cross the Sunday Streets route on Hayes, Divisadero, McAllister, and Eddy Streets. North and southbound traffic should use Masonic, Divisadero or Webster Streets instead of Fillmore St.
East and westbound traffic should use Fell, Hayes, McAllister, Eddy Streets or Geary Blvd instead of Fulton St. If you need vehicle access to/from your home, place of business, or place of worship during this time, please contact us as early as possible. Email sundayastreets@livablecity.org or call 415-344-0489 to coordinate access.